Well, it’s winter. Instead of ruefully awaiting spring, I prefer to look at works of art that evoke the idea of winter, one way or another. It’s always interesting to me how artists can capture some nuance of a season, be it with light, color, or composition. With this print, I can hear the crunch of snow under foot and feel the frosty air! 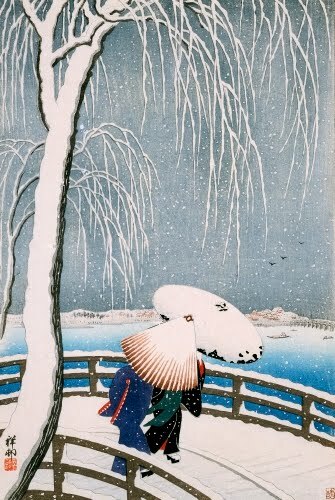 The Japanese artists of the Ukiyo-e style certainly perfected the atmospheric depiction of snowy weather in woodblock color prints. The perfection of this technique, using small holes in the woodblock for background colors to denote falling snowflakes was pioneered by carvers under the direction of the landscape master of the Edo Period: Hiroshige I (1797–1858). Ohara, known as Shoson after 1918, admirably mastered this technique in his ode to the heyday of the Ukiyo-e style, which includes a more solidly Western take on perspective. Koson is one of the masters of the Shinhan-ga (new art prints) movement at the turn of the 1900s, a movement that sought to revive the subjects and style of Ukiyo-e from the Edo (1615–1868) and Meiji (1868–1912) periods. His biggest claim to fame was the exploration of the Kacho-ga (bird-and-flower) prints. These too he executed with a Western-influenced realism and perspective, marketing his prints primarily in the West. I don’t know many artists whose paintings of New York in a winter atmosphere carry more reverie for me other than Ernest Lawson. I’ve been in New York in winter many times, and this artist really hit the nail on the head. While Manhattan is a lot more developed than it was when Lawson painted it, I feel as if I’m squinting with snowflakes hitting my eyes. 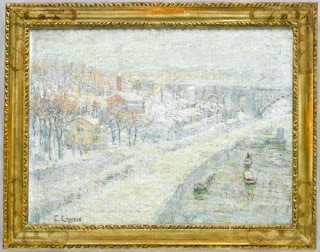 Lawson’s attachment for Impressionism grew after a visit to Paris from 1893 to 1896, especially after he met the leading impressionist Alfred Sisley (1839–1899). Sisley and American Impressionist John Henry Twachtman (1853–1902) held the strongest influence in the development of his mature style. While in France, Lawson concentrated on painting landscapes outdoors (en plein air). In 1898 he moved to the Washington Heights section of New York, from which this scene is painted. Compared to the other urban realists of The Eight, Lawson’s work takes on an almost lyrical nature. 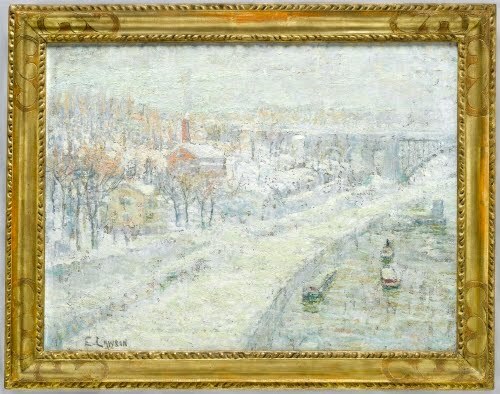 The brush work and strong construction of the forms are the influence of the French impressionists, while the high-key palette and frequent emphasis on winter light are the influence of Twachtman. Lawson often used a palette knife to apply thick passages of color in order to build up the surface. If you’ve ever looked out of a plane window flying over winter fields or a winter townscape, then you’ll totally get this painting. 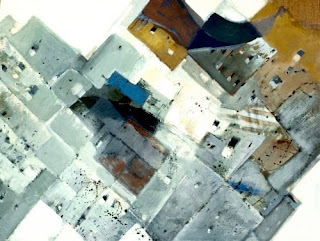 Martyl was known for her abstract landscapes, and this is a perfect example how she takes common aerial views and combines them with an abstract aesthetic. Considered a child prodigy artist by the age of eleven, Martyl studied painting at the school of the Saint Louis Art Museum. Unfortunately, she is most well-known not for her beautiful abstract landscapes and silver point drawings, but rather the “Doomsday Clock” that she designed for the cover of the Union of Atomic Scientists journal in 1947. Her husband was a nuclear scientist who worked on the Manhattan Project, which developed the first atom bomb. I’m pretty sure in a couple of months we’ll all be dreaming about doing something like this as we get tired of the “W” word. The Winterthur Museum in Delaware has an astounding collection of early 1900s graphic design advertising media, from trade cards to these “poster” stamps. 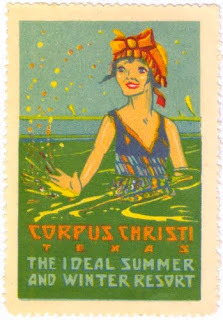 These printed stamps served the same function as posters, but were mobile, stuck as it were on the outside of packages, postal advertisement, and bills. They had, however, the same refined aesthetic as regular posters during the “golden age” of the poster (ca. 1910s–1940s).